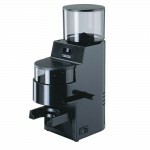 Gaggia 8002 MDF Burr Grinder comes in black color. It is known for good durability, Italian quality and 50mm Steel burrs provide consistent grinding. 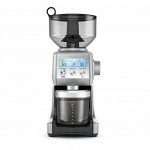 It has 34 steps of adjustments, allowing to produce grinds for many brewing methods, from espresso to French press. It has its pros and cons, but it has a good price to quality ratio. It uses semi-commercial grade steel burrs in a semi-commercial (and hence longer lasting) burr set. 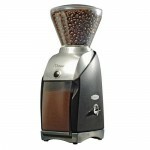 It is especially good if you are looking for a grinder in a range 200-250$ that produces quality espresso. The grind does not include larger chunks nor coffee dust. It reduces noise of the grinder. It generates less heat so the coffee stays cool to prevent oxidization for maximum retention of aroma. It is not the fastest grinder though. It takes almost 30 seconds to make a double shot. But because of its slowness it does not heat the coffee, making a grind better. Bean hopper has the capacity of 10 ounces (284g) and is made of smoked plastic. It is easy to use. It can also be removed for cleaning and inserting beans. The grinder has 34 grind settings. Bean sizes and different kinds of beans will demand the minor grind adjustment. At start it might be a bit hard to find a perfect setting, but after some use, the customers generally found their best way to use. The grinder comes equipped with the doser, which according to customers is the root of many problems. By pulling the lever forward once, it’s supposed to dose about 7 grams of ground coffee for one shot and twice for a double shot to a porta filter basket. If beans are ground, the grinds fall straight into the doser, which cannot be removed. It is great if you make lots and lots of espresso, but if this isn’t the case for you then the doser can be inconvenient. You cannot see how much you are grinding, so you can either grind what you need and press the doser handle several times until your porta filter is full, or else you can grind extra and have a little waste. The solution is to weigh the grounds before loading them up into the basket. Or at least set the amount of beans you think is correct. The housing material of the grinder is plastic. Bean hopper is made of smoked plastic. It is very durable and plastic also makes it lighter. As mentioned earlier, the grinder is equipped with gear-reduction system which decreases the noise. It is therefore not extremely noisy, but also not very silent. It produces the sound of around 80 decibels. Is relatively easy, you also get a dusting brush beside grinder when you buy it. Instructions are included and also published on internet by Gaggia. Consumers are in general satisfied with the product. They report it is very durable and consistent, but also report doser inconveniences described above (at section of Functions). Majority is satisfied with price to quality ratio. It also lacks a rubber feet, so it sometimes slides on surface. Not a big issue though, as you can simply put it on rubber surface. 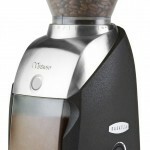 The price of the grinder fluctuates quite a lot, but can be found between 210$ and 250$ on Amazon, depending on a day. The grinder also comes with some additions – a dusting brush, frothing pitcher and espresso tamper – they are already included in the price. 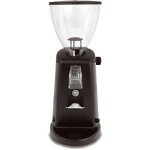 It is a very good grinder for a given price range. Consistency of grinding is great and grinder in many cases holds up to twenty years and even more. It is well constructed and in is proved to be very durable on the long run. So if you are looking for a consistent grinder in price range of 200-250$, this might be a good candidate.